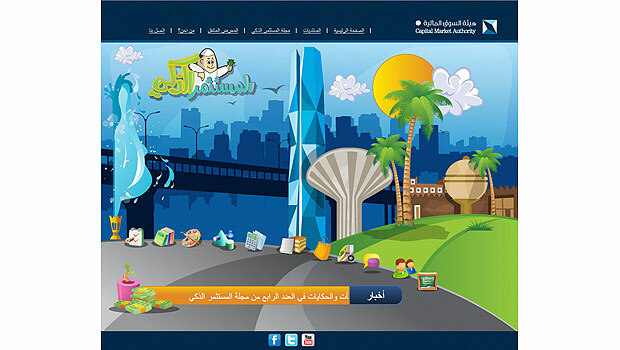 An interactive website for the "Smart Investor" program is another step by the Capital Market Authority (CMA) to expand its special financial education program for children. The move follows a series of awareness campaigns that targeted schoolchildren. It included lectures and a "financial football" game. The "smart investor" website is a part of CMA's social program for financial awareness. This program plans to build up the right financial culture among youngsters, between the ages 9 and 14, as they are future investors. Its main aim is to help develop proper financial transaction rules and to turn the positive results from financial education to an interactive medium for targeted groups. These efforts would eventually build up a financially conscious generation. The youngsters are also trained to carry out positive dialogue with the community in related fields. The program also aims to train students in all daily financial transactions, in addition to principles of money management and investments in addition to an introduction to the financial bodies and the role of each one. The program also aims to instill religious values in the students. A specialized team of consultants and financial and educational professionals is responsible for preparing relevant content in a bid to create a proper scientific and educational background for targeted groups. The CMA also cited other countries' experiences that had positive effects in this field. CMA hopes that the website would become a trusted source in financial education, according to a statement. The website comprises several interesting sections such as the "smart painter", games and quizzes. It will also include a section for Smart Investor friends, with pictures and information about hobbies and interests. The website’s launch was followed by three related platforms on Facebook, Twitter and YouTube. These sites will be up to date with "Smart Investor" news and some awareness messages. The statement stressed that a key goal of the CMA is raising awareness among investors. The authority has already published 14 informative booklets that are distributed free during road shows at school, universities and malls across the Kingdom. They are also available on the official website. The CMA has also created pages on Facebook, Twitter and YouTube that provide the latest information from the authority.